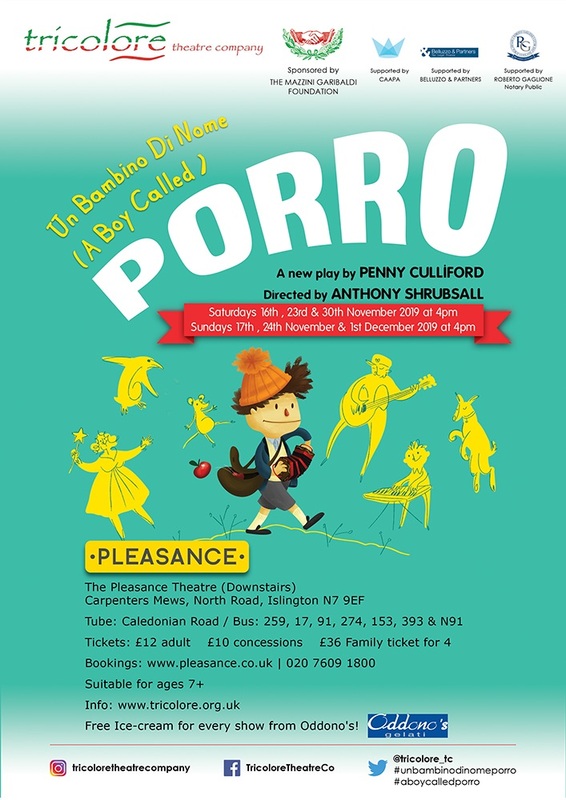 Tricolore's latest bilingual play for children (7+), Un Bambino di Nome Porro (A Boy Called Porro), will be premiered at the Pleasance Theatre in Islington in November 2019. Performances on Saturdays and Sundays at 4pm: 16th, 17th, 23rd, 24th & 30th November and 1st December. Click the image to book tickets. Saffron Hill, written to commemorate the 150th Anniversary of The Mazzini Garibaldi Club and the 150th Anniversary of Giuseppe Garibaldi’s visit to London in 1864, received its premiere production at The Pleasance Theatre, Islington in October 2015. 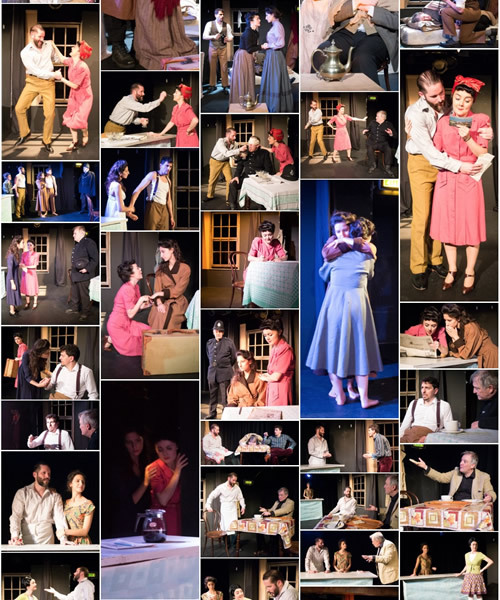 Click the photo gallery image for the Saffron Hill page, which features reviews, commendations and programme, in addition to the photo gallery illustrated here. Tricolore would like to thank The Mazzini Garibaldi Foundation, whose generous sponsorship made this production possible. Tricolore also gratefully acknowledges the support of its food and drink sponsors, who provided wonderful hospitality during the Pleasance Theatre run of the play. See the links page for details of sponsors and links to their respective websites. Saffron Hill is a new play in three scenes by Penny Culliford that follows the lives and fortunes of generations of a fictional family in Saffron Hill, Clerkenwell from the 1870s to the 1960s. The play explores, through the eyes of this family, the issues, attitudes and music of the times. Although based around historical events, this is very much the stories of the personal lives, loves and losses of Italian immigrant families living in this area. The Golden Chain / La Catena d'Oro, was Tricolore's second bilingual (English & Italian) project based on a play by Penny Culliford. The show premiered at Theatro Technis in June 2012, under the direction of Kenneth Michaels. 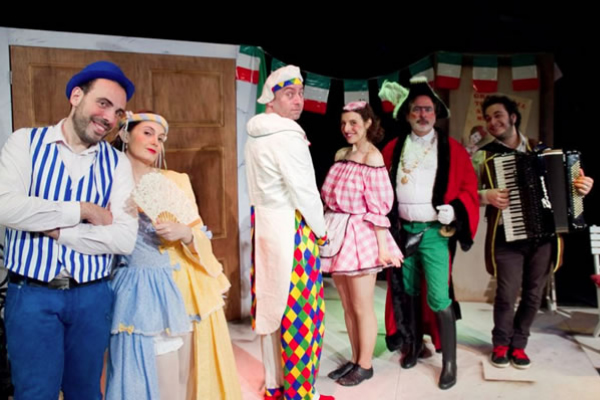 The cast (as pictured left to right) was as follows: Simone Douani, Eugenia Caruso, Phil Gerrard, Nadia Ostacchini and Drew McKenzie. The accordionist was Giorgio Albanese. This production would not have been possible without the generous financial support of the Mazzini-Garibaldi Charitable Foundation. Click below for a trailer of the show on YouTube. 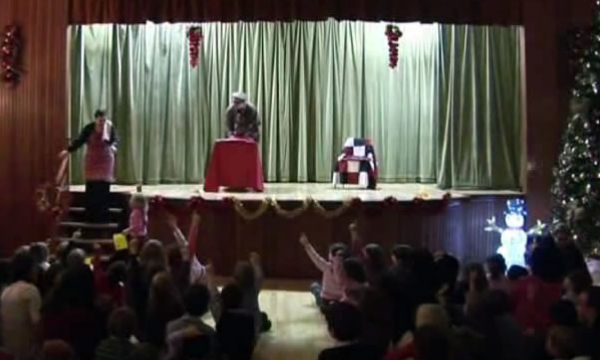 Tricolore's first bilingual play was The Gingerbread Man / L'Ometto di Pan Pepato. 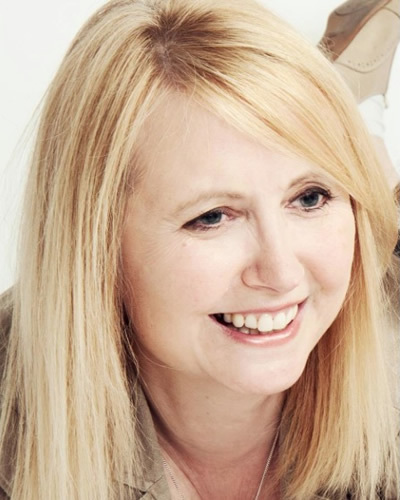 The traditional children's story was adapted by playwright and children's author Penny Culliford. The production, which was directed by Liz Felton, toured to Rome in 2009 and was also warmly received at The Italian Cultural Institute in London, the Scalabrini Centre, St Peters Catholic Youth Club, Cambridge Italian Club, the Italian Bookshop and St Luke's Community Centre. 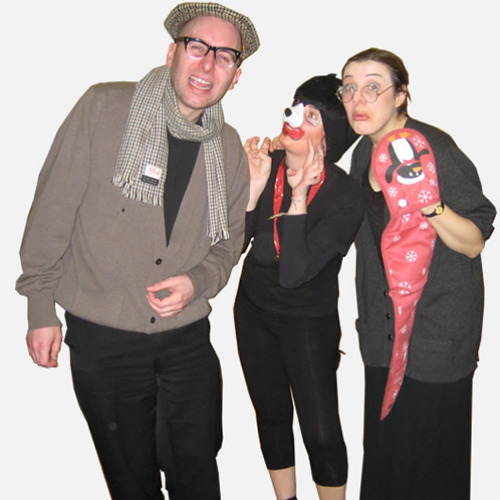 The actors (as pictured below left to right) were Phil Gerrard, Eugenia Caruso and Nadia Ostacchini. 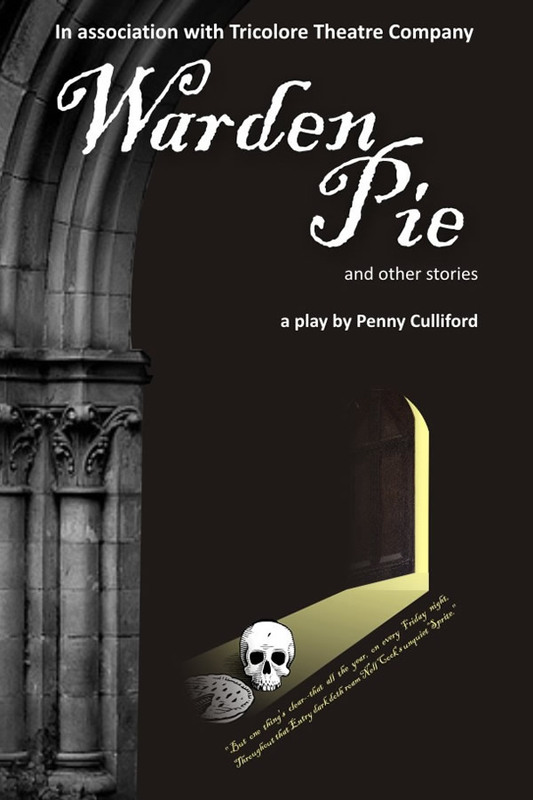 In 2011, Tricolore toured the premiere production of Penny Culliford's one-act play Warden Pie. Warden Pie was based on Dark Entry, The Legend of Nell Cook from the Ingoldsby Legends by Rev Richard H Barham. 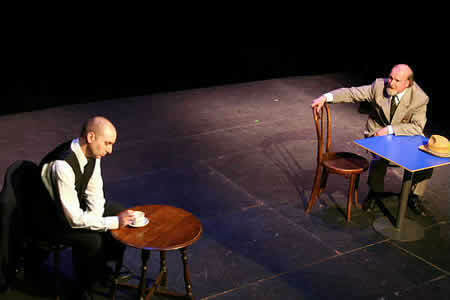 Tricolore staged the premiere production of The Condor and the Maiden, by Dermot Murphy, directed by Simone Vause, at The King's Head Theatre, London in 2010. The cast were as follows: Nadia Ostacchini & Christopher Rees, (below) Lindsey Readman & Jennifer Jackson, (not pictured) Phil Gerrard & Michael Tomsu. Tricolore's first fully staged production was performed at Teatroshorts 2008, a festival of short stage plays, organised by our friends at Italian Nights. Tricolore's offering was The Man with the Flower in His Mouth by Pirandello, performed by Phil Gerrard, Peter Sutton and Nadia Ostacchini. The event was hosted by RADA, with performances in the Jerwood Vanbrugh Theatre.